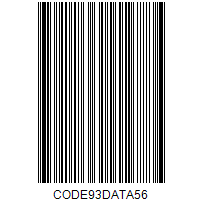 Code 93 is a linear barcode symbology with a higher density and data security compared with Code 39. It encodes alphanumeric data (upper case letters and numeric digits) with a variable length. RasterEdge .NET Image Barcode Add-on supports integrating Code 93 barcode image into .NET Class Library, ASP.NET web application and WinForms program using Visual C# code. This control library is designed for Microsoft Visual .NET Framework 2.0, 3.0, 3.5 or later versions, and can be integrated with Visual Studio 2005 or above. Download the trial package for a test now to write and draw the best Code 93 barcode pictures in png, jpeg, gif, bmp, TIFF, PDF, Word, Excel and PowerPoint. You can easily generator Code93 barcode and save it to image files/object using this C#.NET barcode generator control. The following steps will show how to create a Code93 type barcode encoding numeric data text "CODE93DATA" into the image object with XImage.Barcode.Creator. Please copy the sample code as follow to generator a Code93 barcode. RasterEdge enables C# developers to create Code 93 on popular image files, including BMP, GIF, JPEG and PNG formats. Demonstrated is an example to create a single Code 93 bar code image on a local png file using C# programming. Users can freely adjust the coordinates to change barcode location on the image, and also create batch Code 93 as well. For more barcode sizing details, please navigate to the property table below. Visual C# examples here for developers to create and write Code 93 linear barcode pictures on PDF documents, multi-page TIFF, Microsoft Office Word, Excel and PowerPoint. Please create a Windows application or ASP.NET web form and copy the C# sample code below to your .NET project for an evaluation. Complete C#.NET sample code for Code 93 generation and customization on images & documents, including all the parameters listed above.